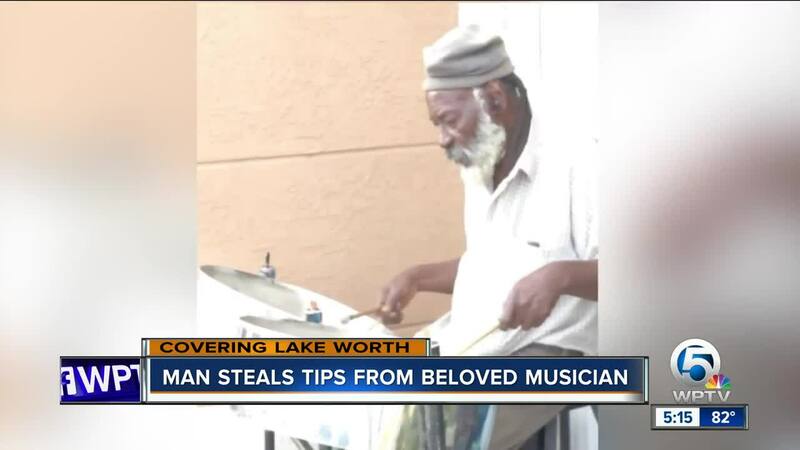 A beloved, elderly musician is robbed while playing music in downtown Lake Worth and now, the community is rallying together to help him. Selman runs the local chapter Can I Help You Lake Worth , which performs charitable causes throughout the community. He and others took that spirit and put it toward helping Peter. Now, the downtown business community is raising money for Peter and a fundraiser on GoFundMe has also been launched to help him . "When someone that means that much to the community and has given so much of themselves has fallen on hard times, it only seems right that when that happens we should all get together and do what we can to try and help out," said Selman. Peter was too shy to speak with WPTV for this report, which Selman said shows how humble he always is. "After everything happened, he just started playing steel drums again that night," said Selman. In the video, the suspect is wearing a dark hoodie with distinctive grey colored Nike shoes. If you know who stole the tip jar, call PBSO Crimestoppers . Selman is encouraging the suspect to bring the money back to Kava Sutra. "At the very least, just walk by again and put the money back," said Selman. "Just do the right thing, find it in your heart to do the right thing."